Above, Mr. Big: playing live in the living room. 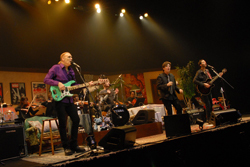 While clearly displaying Mr. Big's individual and collective talents, Live from the Living Room also demonstrates how important melody and strong vocal harmonies are important to any song/music no matter what the genre. Whether it's their classic To Be With You or others like As Far As I Can See and Stranger In My Life, these songs prove Mr. Big's knack for this important element in the song. A second notable thing about this recording is how good Paul Gilbert really is: the acoustic guitar work is a lively as it is inspired. You also get a sense of how blues influenced the band while listening to Voodoo Kiss. Live from the Living Room, as mentioned, is largely acoustic. But the band does get electric, with the closing number Nobody Left to Blame quite rousing. The band also had string quintet, with arrangements provided by Takashi Miyazaki, to enhance the atmosphere. Overall, Live from the Living Room is a rather impressive, well-played, and entertaining live set. Quite recommended. 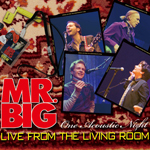 Mr. Big's, largely acoustic, Live from the Living Room is a rather impressive, well-played, and entertaining live set.